Mazzolini Artcraft has been working with wood for over 100 years, following the tradition of our ancestors. Woodcarvings are valuable for their timeless beauty, becoming more precious with each passing year. 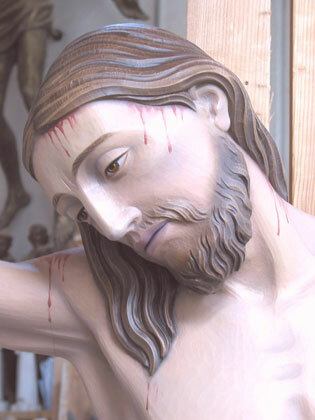 The wood used to create our fine religious works is called Linden wood or also Lime wood ( Lat. Tilia spp.). We import it from Eastern Europe, cut it and kiln dry it as needed to ensure only the best quality pieces are used. Linden wood is perfect for carving custom religious statues since it is not too hard, fairly white in color and, when professionally dried, does not crack like pine wood. And since we use only the trunk to the first branches, the wood has no knots. 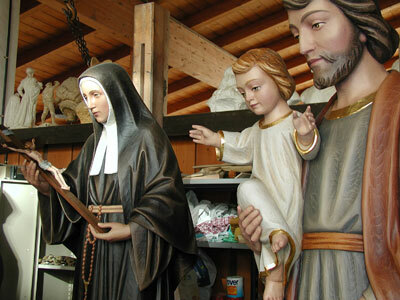 Each statue is made out of different laminated wooden pieces. Wood carving is a laborious process that requires a great attention to detail. First, the artist draws the pattern on the wood. Then, the carver uses drills and chisels of various sizes to pound out the shape and details of the piece. Finally, varnish or paint is applied to the artwork. As you can see from the image on the left, a lot of work goes into each carving.